The Fitch Fuel Catalyst named the official fuel treatment for the AMA Prostar Drag Racing Series. The Fitch Fuel Catalyst is approved for use by competitors in all AMA sanctioned events. Power Sports vehicles (including motorcycles, ATV's, scooters, snowmobiles, personal watercraft and mopeds) benefit greatly from the Fitch® Fuel Catalyst. Engines can be easily equipped with one or more "Drop-In" units. As the name suggests, the smaller unit actually drops directly into the fuel tank. After a Fitch® Fuel Catalyst is installed, the engine will almost immediately experience a cleaning of the fuel system. in a short time, there will be a noticeable increase in power and performance, and the engine will start easier, run smoother and last longer. though the Fitch® Fuel Catalyst can greatly affect the efficiency of gas and diesel fueled engines, it cannot overcome mechanical or electrical problems. 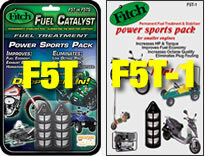 The Fitch Fuel Catalyst part # F5T is for all brand motorcycles, ATVs, Snowmobiles, and Jet Skis and the F5T-1 is for smaller engines like mopeds and scooters. Simply drop the unit/s into the fuel tank, the unit/s will gravitate to the lowest point of the tank and will remain there treating the fuel for 250,000 miles. The Fitch unit will not bounce or rattle around because fuel acts as a hydraulic cushion that only allows the Fitch drop-in to move slightly with the movement of the fuel, not the movement of the machine. The Fitch Fuel Catalyst will not harm any internal fuel tank components. Although the Fitch Fuel Catalyst has a beneficial effect on gas and diesel fueled engines, it cannot overcome mechanical or electrical problems. NOTE: Aggressive competitors that run fuel below 1/8 tank of fuel should pre-treat fuel in can and pour treated fuel in machine instead of dropping the unit into the fuel tank. SUZUKI HAYBUSA SETS LAND SPEED RECORD USING FITCH FUEL CATALYST !! Congratulations to Fred Klies, of Eastern Cycle Performance, and Mike Sweeny for setting a new Land Speed record in the Altered Power Streamliner-Gas Class. Driving a Suzuki GSX 1300R Hayabusa, prepared by Mr. Klies, Mr. Sweeny bested the prior mark of 196.800 MPH by recording a speed of 201.798 MPH over a 1 mile run from a standing start. "I want to thank Advanced Power Systems International for making the Fitch Fuel Catalyst available to us. They played a key role in this record setting performance." said Fred Klies. "Our game at ECP is to produce as much HP as possible with careful engine design and tuning without the benefit of outside/artificial power enhancers. Utilizing the Fitch Fuel Catalyst has allowed us a little extra edge by insuring the fuel going into the engine is of optimal potency and is what the engine designer had in mind when they built the engine." Bob Carlson wins the 2008 NHRA Northeast Division 1 Motorcycle Championship using the Fitch fuel Catalyst! Bob has been an on-going customer for Fitch and also uses the product in his heating business. Quote: ...over 75% of the competitors in my MCD Drag race series are all using Fitch in their bikes. Click the picture for his testimonial. Click Here for a great article and explanation from Snow Tech Magazine about the Fitch Fuel Catalyst and their experiences through out the years. "QUOTE: We continue to have good luck avoiding most of these issues with the use of Fitch Fuel Catalysts in everything from lawn mowers to snow blowers, and now have one in every gas can. These small cages with some sort of metal inside act like a mini-refinery, helping to keep the gas fresher, longer. Click Here for pictures of the inside of a carb float bowl that was removed from a bike that had been running the Fitch for a few years. The bike's fuel tank and carb float bowl were never drained of fuel in the off season and also never used fuel stabilzers. Just parked and then run each season. It was never started or run through the winter seasons. Check it out to see how the Fitch worked to keep the fuel clean!!! Click For Dyno Test,Toads Cycle Works, 1999 HD Custom Softail !! Click For Dyno Test, 1988 HD Softail!! Click For 1994 Harley Dresser Emissions Test!! Click For Zandi's V Twin Service Dyno Test !! Gateway Motosports Dyno Test!! I put the Fitch in a while back and son of a gun, there was a change in the way the bike runs. I had to re-tune my idle first off. After that the motor settled right down and became very smooth. It will idle in it's rubber mounts (2002 FLHT) and the horn mounted on the left side doesn't even bounce around. Amazing! The motor by the way is 88 ci but the heads have been flowed (Hi-Per Cycle) and a set of Mackie cams push the valves. There are some minor carb mods with a Ness Super Sucker on the front end and a White Bother's 'E' series 2 into 1 pipe on the back end. This combo works extremely well and the Fitch sort of smoothed it out very nicely. .....we can tell you we are so far impressed with what weve seen.........and it really seems to make a difference--they run clean and don't ping at all. We asked around and the word seems to be pretty consistant....fuel problems seem to go away. Gas seems to stay fresher longer. No gun, no greenies,no problems! Check out our magazine reviews for much more from Snow Tech! NO MORE DETONATION PROBLEM ..... At White Bothers, we are very choosy about the products we carry and promote. When we were first approached to carry the Fitch Fuel Catalyst we were very skeptical. Our technicians thoroughly tested the product on the dyno and in field trials and were convinced the product lives up to all its claims. Tests on the Buell Blast showed gains of 2 HP while the DRZ400 got rid of a detonation problem with gains in HP & torque. One of the biggest benefits, we feel, is it will improve fuel quality and keep fuel fresh all the time.
" The Fitch Fuel Catalyst definitely makes a difference, I use it in all my bikes now!" "The Chi-Town Hustlers motorcycle road racing team has been having a great 2002 season. All five of our riders have recorded numerous trophy-winning finishes. The team uses Fitch Fuel Catalyst in all of our race bikes as well as in our fuel strorage cans. No more problems with fuel evaporating and carbs becoming clogged with gummy deposits during transport either. Thanks to Fitch our bikes are fast and they are winning !" "I have used this in my sportbikes for a few years and in my RX7. I added this AFTER modifying the exhaust & jetting on the sportbikes and was able to get back 3mpg and idle quality (smoothness). The engine oil stays cleaner. When changing the oil it has hardly changed color. On my Mean Streak it has smoothed out the idle a bunch, no difference in mileage (probably 'cause it's EFI). I can run a lower grade of fuel if I have to, without the bike knocking. "I was not certain at first if the catalyst would make any difference. However I have had one installed since April 02 and the bike runs much better. I had the bike sitting for several weeks and there was no gas deterioration. Excellent product, which I would purchase again if needed." Nate Jones, Scarborough, ME Owner, Custom Hawg Parts & Accessories, Inc.
"I am the owner of Custom Hawg Parts & Accessories an authorized American IronHorse dealer. Already being more than pleased with performance of my personal bike a 2001 American IronHorse Slammer I was intrigued to see just what the Fitch Fuel Catalyst might do for it. I noticed with the first tank of gas an immediate difference in the fuel economy. I went from getting an average of 80 miles per tank to an average of 105 miles per tank. Needless to say I was sold on the product instantly. " 1998 Suzuki 1400 Intruder and 1988 Heritage Softail Classic...,We were both skeptical but after only one tank of gas we were impressed. My 1400's idle's picked up about 300 to 500 rpm after only about 15 minutes of running with the catalyst. The backfiring that plagued my bike over the previous tanks of gas disappeared. Glens bike is starting easier and has to spend less time with the choke on. Overall we both feel that the Fitch, we added to our tanks, have had a major positive effect on the overall performance of our motorcycles and are advising all of our riding friends to get over to Custom Cycles in Drumheller and "get the Fitch advantage!" I used it on my Grand Touring Bombardier during the past season. I found that it increased the gas mileage and no fouling spark plugs. In fact I did not have to change plugs in 3,700 Km. I would recommend it to any user of gas engines. That's an average of approx. 266km !!! and still counting. The proof's in the puddin' baby !!! the performance improvements I added are : Jardine pipes, K&N air filter, DynoJet carb kit ( jets increased from 35 mm to 45 mm ) gas mileage decreased from 230 km, not including reserve to 160 km per tank, including reserve so I put the F5's in last Wednesday, after the dyno run, and I'm on tank #4 now. Tank # 1 - 200 km, including no kms on reserve ( 75 km in expressway, 125 km in cottage country, windy roads, just touring ) - 25 % or 40 km increase. Tank # 2 - 175 km, including no kms on reserve ( all expressway +130 km/h bucking a headwind - I would expect 150 km normally rather than 160 km due to the winds and high speeds ) - 16 % or 25 km increase. Tank # 3 - 190 km, including under 5 km on reserve ( all expressway +130 km/h - I would expect 150 km normally rather than 160 km due to the high speeds ) - 20 % or 40 km increase. Click here for pic of Ron's Bike! .... as you know I put your product into my new FLH. I was astounded by the results! My old gas mileage was 16.2 km to a litre, with my first test tank my mileage increased to 20.02km per litre. A significant increase. I will be putting it into my cars some time soon. My bike is running just that much better with a Fitch Fuel Catalyst, supplied by PM Cycles In Nova Scotia, just love that extra mileage ! I was at first skeptical, to say the least to think that by just dropping the units in my tank that my performance would increase along with my fuel mileage. I must say that the catalyst performed just as he said it would , smoother running and a definite feel of strong performance was very noticeable on an already well performing Harley. I have been driving this bike since it was new and I can't get over how much different it performs. It is much smoother through the gears, and when I open the throttle.... it is right there. The bike has always worked well but this is a noticiable difference! The two fillups prior to the carb work revealed an improvement in mileage (about 5%) and an improvement in combustion stability. It reduced, but did not eliminate, exhaust detonation on the overrun. Once the carbs air leaks were stopped, which turned out to be the major problem, the popping and banging disappeared. We also shimmed the needles and richened the low speed mixture. This is now a different bike! Can you believe a Thunderbird that can keep up with a goosed Ducati Monster on acceleration? I do think that the catalyst helped. After the installation, there was a noticeable improvement in the transition from pilot to mid-range throttle positions. I really noticed the difference at Shubenacadie because it is a road-race track which has very few places for the bike to operate wide-open yet the performance was smoother and more predictable.......I do believe this product is working, so much so that I have purchased an additional unit for the Vincent Sidecar Racer. "The members of Toronto Chapter Harley Owners Group, including myself, are extremely pleased with the Fitch Fuel Catalyst. The product has delivered everything promised which, in these times, is a rarity. All members, who have purchased the product, are experiencing better performance, increased mileage and easier starting. " " we were all impressed by the immediate improvement in performance, so much so that we took turns putting it in their bikes too. Fitch works ! No, Fitch really works!!!" " Fitch's Fuel Catalyst Delivers.....Over the course of a couple of weeks of riding, the average fuel economy went from 27 mpg (city driving) before the test to 29 mpg immediately, then ultimately to 33 mpg, where it stabilized." Iron Works Magazine, July 2001, Dyno Testing the Fitch with test bike and dyno courtesy of S&S Cycle. "...I repeated my power runs and compared the best of the three latest runs to the the best run without the catalyst. Shazam ! The latest showed an increase of 1.4 hp / 1.2 ft-lbs. at peak power (6,200 rpm) with a gain of almost 3-1/2 horsepower at 5500 rpm!!..." Being a skeptic of many things such as oil and fuel additives I was reluctant to try the Fitch Fuel Catalsyt, even though the facts were there in front of me in black and white. Still I saw no sense in purchasing the product right away. My 74 cubic inch shovelhead like most shovels had the reputation of being somewhat tempermental at times. Especially at stop signs at a low idle. Regardless of multiple attempts to adjust my carb and timing I have allways had that problem, and being strickly a kicker I had no magic button to push to get me moving in traffic quickly. As fate will have it all my hitchs were cured only 20 minutes after I purchased Fitch. I dropped them in my tanks and before I knew it I was sitting in traffic expecting a cough and a stall. But it didn`t happen. And it has not happened since. I soon also noticed a quicker throttle response and a decrease in my fuel consumption. If Fitch can make a believer out of a skeptic like myself, It is in my opinion, the best, if not the only product of its kind to live up to its reputation. To Check out Anthony's ride, click here. I've found better overall starting and overall improved performance. The engine runs smoother and plug fouling was minimal. When I tested it on an Indy 500 E.F.I. the fuel mileage was much better than without the Fitch. "...I do know that the fuel problem that I was having cleared up after a tank of fuel and my gas mileage has improved since the installation.....Where else can you find that kind of horsepower,torque and fuel economy for that kind of money?" "..an immediate increase in fuel mileage and a smoother idling motor on the Titan motorcycle....The Fitch Fuel Catalyst is one of the best values in performance increases available today!!" I have never had something that work so good. (Fitch is the answer) to all fuel problems. Easy starting, MORE power No smoke that I could see. Had a flat spot between 80KMs and 100Kms.......WELL IT'S GONE!!!!!! ...Just wanted to quickly comment re-Fitch application to K75BMW..I immediately noticed a change in the smoothness of the engine,and the K is pretty damn smooth to start with !! Also and increase in power,resulting in a speeding ticket on the way home from your shop.....haha!